You don't cut him off mid-funk! Set at some undisclosed time in Bill "Did I ever tell you about the time I made out with Vicki Appleby?" Haverchuck's future. This song has made me very happy for over a month. When I first heard this I thought, "THIS is Bill!" We catch up to Bill trying to liven up a party he and his girlfriend are hosting. I started singing this song as I was leaving home today, and decided to finally post this mix. Expanding on that happiness… next are The Meters. Great song. I have Rejuvenation on vinyl and it is a go-to record for a feel good fix. Bill starts to get his funk on with "Hey Pocky A-Way". Bill's girlfriend tries to be something as she puts this song on. Eighties ironic? Funny? In the know with bands with great names? This song and its video are very amusing, and short. Great lyrics - flipping an eighties synth song with modern themes and lingo. This plays as Bill's girlfriend proceeds to have a stick/bug/wild hair, contained in her posterior, direct her to break her relationship off with poor Mr. Haverchuck. Orange Juice will help with the pain, buddy. A song for reflection. When I go for some time without listening to Hem, I forget music like this exists and am gob smacked, yet again, by its beauty and serenity. MPDG voice. "Skinny backin' monkey and hit mea!" Love love love me some Deee-Lite. Bill meets his Manic Pixie Dream Girl (MPDG). Funk, dance, sugar, sunshine, butterflies and an infectious groove. Track 3 from What's the 411? Like "Heart Be Still", "Real Love" was released in 1992. Very similar in ingredients to the last song, but without so much funk. Fantastic, dreamy vibe. Thinking of her. Heaven forbid that Breakfast at Tiffany's ever be made again, but this would work well for it. Oh, Holly Golightly, one of the great MPDGs. Bill getting ready for his first scheduled meeting with MPDG. 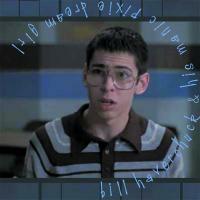 One of my favorite parts of Freaks and Geeks was when Bill is dancing for Neil and Sam, when Neil turns off the music. Bill says, "You cut me off mid-funk!" Brilliant. This is for you, Bill. 1st date. I first heard this song near the end of Ma femme est une actrice, with Charlotte Gainsbourg and her husband Yvan. The song has a St. Etienne, late-60's, electro-lounge vibe to it. Love love love the lyrics. From mybrightestdiamond.com/2008/09/ "After having fled Germany to escape the Nazi’s in 1933, composer Kurt Weill penned the music for “Youkali:Tango Habenera”. Years later, Roger Fernay added lyrics describing a vagabond trip to an island of bliss called Youkali, whereupon landing a fairy would act as one’s personal tour guide. Youkali is a land of happiness and fulfilled desire, a place where all the stars shine brighter. But the dreamy mists dissipate in the second verse, as life progresses only tediously while poor human souls seek to escape to the mysterious utopia in vain." Beautiful song. Reminds me of Edith Piaf. Shara (MBD) plays The Queen on The Decemberist's Hazards of Love album. Exercise time! Bill plays his handy workout LP. Vetiver covers "Burning for You", so I was investigating the song and found this exercise version of the original song. It sat in my cart for a while, and then Bill told me to add it. The song plays in the background as Arnie counts off twelve reps for the tricep dips, followed by bend over rolls. "Down. Up. Down. Up." Brilliant. If you don't feel like exercising, the song serves as a nice intermission. Go get an orange soda for me, while you're up. 2nd date. One of my new favorite songs. 2009 has been incredible so far. I would like to walk around in the city of this song for some time everyday. A good close to a great evening. Dan's solo album is part of my increasing faith that 2009 will be an amazing year for new music. Oh, this song is amazing. Things are going smoothly, "Easy", if you will. Call me a reckless wrecking ball"
Putting the "Manic" in Manic Pixie Dream Girl. The one on the left is definitely MPDG material. The guy on the left looks like a lookie bass turd. I was looking for quirky songs and remembered The Incredible Moses Leroy. The album I have of his didn't contain anything I thought would work, so I look to see if he had new material... yes, yes he did. Less quirky, but 100% perfect for this mix. I absolutely love the atmosphere of the song. The piano and background vocals paint such a wonderful landscape. This is a from the "robot" to someone he misses. You even helped me find my heart"
Track 4 from Ex-Voto E.P. The reconciliation of Bill and his best friend. Liela Moss has been my manic pixie dream girl, for just over a month. I first heard The Duke Spirit on their colaboration with UNKLE, and I have been obsessing with them ever since. Great title I found in my collection. Yay for Neil Halstead and xylophone. Totally works for bridging TDS with Vetiver. I was going to have two songs from The Duke Spirit and Dent May, but Vetiver gets the extra love. This is a cover of a song made famous by The Everly Brothers. Bill and his Manic Pixie Dream Girl walk/ride off to the unknown. Fade to pastel black. Good ending track. I think I need a copy of this whole CD. Wanna trade soon? Bill is probably my most favorite TV character ever! Eventhough I was Lindsay! I was gone the moment he dressed up as the Bionic Woman for Halloween.